Little is known of the Stickney Safety Steam Generator for Automobiles besides this surviving brochure. The testimonials are dated late 1904. This six-page brochure for the Stickney Safety Steam Generator carries many testimonials. 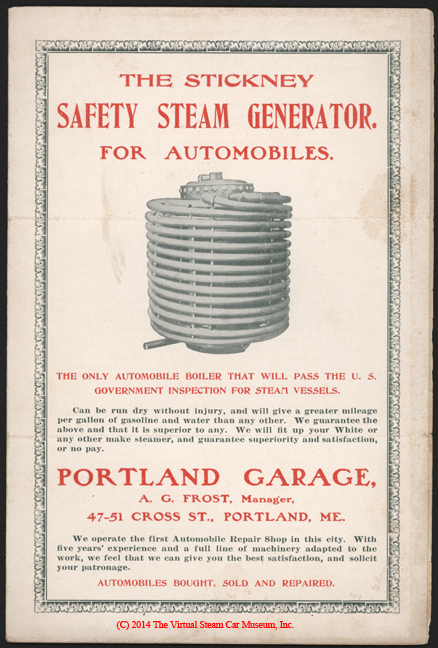 The brochure carries the name of the Portland Garage, A. G. Frost, Manager prominently printed on the first page. This was not a brochure sent to a distributor, and the relationship between Frost and Stickney is yet to be researched.